Pura Besakih, one of Bali's most significant Hindu temples. 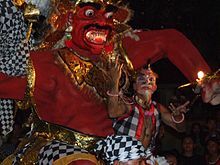 Balinese Hinduism (Indonesian: Agama Hindu Dharma; Agama Tirtha; Agama Air Suci; Agama Hindu Bali) is the form of Hinduism practiced by the majority of the population of Bali. This is particularly associated with the Balinese people residing on the island, and represents a distinct form of Hindu worship incorporating local animism, ancestor worship or Pitru Paksha, and reverence for Buddhist saints or Bodhisattava. The population of Indonesian islands is predominantly Muslim (about 90%). The island of Bali is an exception where 83% of its people identify as Hindu (about 1.7% of the total Indonesian population). Upon independence from the Dutch colonial rule, the 1945 Constitution of Indonesia guaranteed the freedom of religion to all its citizens. In 1952, states Michel Picard – an anthropologist and scholar of Balinese history and religion, the Indonesian Ministry of Religion came under the control of Islamists who severely constrained an acceptable definition of a "religion". To be acceptable as an official Indonesian religion, the ministry defined "religion" as one that is monotheistic, has codified religious law and added a number of requirements. Further, Indonesia denied the rights of citizenship such as the right to vote to anyone not belonging to an officially recognized monotheistic religion. The minority Balinese Hindus adapted and declared their form of Hinduism to be monotheistic, and presented it in a form to be politically eligible for the status of "agama". Balinese Hinduism has been formally recognized by the Indonesian government as one of the official religions practiced in Bali. About 1400 CE, the kingdoms on the Indonesian islands were attacked from coast-based Muslim armies. Over the 15th and 16th centuries, this Muslim campaign led by Sultans targeted Hindu-Buddhist kingdoms and various communities in the Indonesian archipelago, with each Sultan trying to carve out a region or island for control. Four diverse and contentious Islamic Sultanates emerged in north Sumatra (Aceh), south Sumatra, west and central Java, and in southern Borneo (Kalimantan). The violence ended the Hindu-Buddhist kingdoms and communities in many of the islands of Indonesia. In other cases, Hindus and Buddhists left and concentrated as communities in islands that they could defend. Hindus of western Java moved east and then to the island of Bali and the neighboring small islands, thus starting Balinese Hinduism. While this era of religious conflict and inter-Sultanate warfare was unfolding, and new power centers were attempting to consolidate regions under their control, European colonialism arrived. The Indonesian archipelago was soon dominated by the Dutch colonial empire. The Dutch colonial empire helped prevent inter-religious conflict, and it slowly began the process of excavating, understanding and preserving Indonesia's ancient Hindu-Buddhist cultural foundations, particularly in Java and western islands of Indonesia. The petition's focus on the "undivided one" was to satisfy the constitutional requirement that Indonesian citizens have a monotheistic belief in one God. The petitioners identified Ida Sanghyang Widhi Wasa as the undivided one. In the Balinese language this term has two meanings: the Divine ruler of the Universe and the Divine Absolute Cosmic Law. This creative phrase met the monotheistic requirement of the Indonesian Ministry of Religion in the former sense, while the latter sense of its meaning preserved the central ideas of dharma in ancient scripts of Hinduism. Bali became the only part of Indonesia to remain predominantly Hindu. The populations of the islands off the east coast of Bali are also mostly Hindu, and there are Hindu villages scattered near the eastern shore of Java. Sang Hyang Widhi Wasa (left), the Divine Oneness and supreme god (Brahman) of Balinese Hinduism. Acintya is a part of temples, home shrines and ceremonies, remembered with a colorfully decorated stone seat, Padmasana (right). The general beliefs and practices of Agama Hindu Dharma as practiced in Bali are a mixture of ancient traditions and contemporary pressures placed by Indonesian laws that permit only monotheist belief under the national ideology of panca sila. Traditionally, Hinduism in Indonesia had a pantheon of deities and that tradition of belief continues in practice; further, Hinduism in Indonesia granted freedom and flexibility to Hindus as to when, how and where to pray. However, officially, Indonesian government considers and advertises Indonesian Hinduism as a monotheistic religion with certain officially recognized beliefs that comply with its national ideology. Indonesian school text books describe Hinduism as having one supreme being, Hindus offering three daily mandatory prayers, and Hinduism as having certain common beliefs that in part parallel those of Islam. Scholars contest whether these Indonesian government recognized and assigned beliefs reflect the traditional Balinese Hindu beliefs and practices before Indonesia gained independence from Dutch colonial rule. A belief in one supreme being called 'Ida Sanghyang Widi Wasa', 'Sang Hyang Tunggal', or 'Sang Hyang Acintya'. A belief that all of the gods are manifestations of this supreme being. This belief is the same as the belief of Smartism, which also holds that the different forms of gods and goddesses, Vishnu, Siva, Shakti (Devi) are different aspects of the same Supreme Being. Shiva is also worshipped in other forms such as "Batara Guru" and "Maharaja Dewa" (Mahadeva). Some of many Hindu gods and goddesses of Balinese Hinduism: Ganesha (left), Wisnu on Garuda. In Balinese Hindu texts, the alternate tripartite concept of Shiva of Indian Shaivism is also found. This is usually referred in Balinese as "Siwa-Sadasiwa-Paramasiwa", where Shiva is the creator, the maintainer and the destroyer of cyclic existence. Along with the traditional Hindu trinity, Balinese Hindus worship a range of gods and goddesses (Hyang, Dewata and Batara-Batari), as well others that are unique and not found in Indian Hinduism. Sang Hyang Widhi literally means "Divine Order", also known as Acintya ("Inconceivable") or Sang Hyang Tunggal ("Divine Oneness"), is the concept in Balinese tradition of Hinduism that parallels the metaphysical concept of Brahman among Indian Hindus. Ceremonies include an empty high seated chair. It is also found at the top of the Padmasana shrine outside houses and temples. This is for Sang Hyang Widhi Wasa. According to Balinese Hindu precepts, there are many manifestations of Sang Hyang Widhi Wasa in the form of gods such as Dewi Sri - the goddess of rice, and many other gods associated with mountains, lakes, and the sea. The axiological ideas of Balinese Hinduism parallel those in the Indian Hinduism. However, states Martin Ramstedt – a scholar of Hinduism in Southeast Asia, they are termed somewhat differently and passed on from one generation to the next as a community and at spiritual ceremonies. Unlike the Islamic schools in Indonesia and Hindu Ashrams in India, and in light of the official representation of Balinese Hinduism, the traditional precepts and values are acquired at homes, rituals and through religious symbols. For example, the symbolism connected with the sprinkling of "tirtha", or holy water that bridges the material and the spiritual, this water is first sprinkled over head that is understood as "purification of manah (mind)", then sipped to be understood as "purification of wak (speech)", and then sprinkled over the body symbolizing "purification of kaya (attitude and behavior)". Thus, states Ngurah Nala, the younger generation becomes "acquainted with the ethical values embodied in the concept of tri kaya parisudha, or the attainment of a pure or good mind (manacika), pure or good speech (wacika), and pure conduct (kayika)". There are a total of thirteen ceremonies concerned with life from conception until, but not including, death, each of which have four elements: placation of evil spirits, purification with holy water, wafting of essence, and prayer. These ceremonies mark major events in a person's life, including birth, puberty, tooth filing, and marriage. A new-born baby is believed to represent the soul of an ancestor, and is regarded as a god for the first 42 days of its life. However, the mother is regarded as impure, and is not allowed to participate in any religious activities during this period. A baby must not touch the impure ground until it is 105 days old, half-way to the celebration of its first birthday according to the 210-day Balinese pawukon calendar. Once the child reaches puberty, the six upper canine teeth are filed until they are even. The most important ceremonies take place after death, and result in the soul being freed to be eventually reincarnated. Unlike the death rites of other religions, the physical body is not the focus, as it is seen as nothing more than a temporary container of the soul and fit only for expedient disposal. In fact, the body must be burned before the soul can leave it completely. The cremation ceremony to bring this about can be extremely expensive because an elaborate ceremony is a way of showing respect for a soul destined to become a god with considerable powers over those left behind. Therefore, bodies are sometimes temporarily buried until the family is able to accumulate enough funds for a cremation, although the bodies of priests or high class families are preserved above ground. The most important festival is Galungan (related to Deepavali), a celebration of the triumph of dharma over adharma. It is calculated according to the 210-day Balinese pawukon calendar and takes place on the Wednesday (Buda) of the eleventh week (Dunggulan). According to tradition, the spirits of the dead descend from heaven, to return ten days later on Kuningan. Nyepi, or the Day of Silence, makes the start of the Balinese Saka year, and is marked on the first day of the 10th month, Kedasa. It usually falls in March. The Brahmana caste was further subdivided by these Dutch ethnographers into two: Siwa and Buda. The Siwa caste was subdivided into five – Kemenuh, Keniten, Mas, Manuba and Petapan. This classification was to accommodate the observed marriage between higher caste Brahmana men with lower caste women. The other castes were similarly further sub-classified by these 19th-century and early-20th-century ethnographers based on numerous criteria ranging from profession, endogamy or exogamy or polygamy, and a host of other factors in a manner similar to castas in Spanish colonies such as Mexico, and caste system studies in British colonies such as India. Bali has a caste system similar to the Indian system in its ancient form. In ancient India, caste was called varna, meaning coloring of the neutral or transparent soul or the propensity of the soul to behave according to certain tendencies based on its innate nature. Based on this propensity people selected their profession. Later this process through erosion became a family lineage/birth based system. This same system has been adopted in Bali and it is called 'Wangsa' which is related to the professions of the ancestors. However, even in Bali today, irrespective of the profession of the individual, they claim to belong to their family wangsa. There are four basic wangsa or professions, known collectively as caturwangsa—all Balinese belong to this group. The top three wangsa are, Brahmana, Satria (or Ksatriya) and Wesia (or Wesya) represent nobility, and are known as triwangsa. The fourth and most common wangsa is Sudra. These wangsa groups are subdivided, and each has certain names associated with it. The teachers and priests, Brahmanans, have five subdivisions, and are said to be descended from one individual. Men and women have Ida as the first name. The Ksatriya are traditionally rulers and warriors. Typical names of this wangsa are "Dewa Agung", "Anak Agung"[disambiguation needed] and "I Dewa". The Wesia, most of whom are called Gusti, are considered to have been merchants of different kinds. The most common wangsa in Bali in terms of numbers, is Sudra since 90% of Balinese Hindus belong to it which are the common people as farmers and others. The Pandes or Blacksmiths have a special 'clan' that is not mentioned in the Catur Wangsa group but is considered especially important for its skilled works and being the smithers of fire, Dewa Agni or Dewa Brahma. Under no circumstances may Balinese Hindus consume the flesh of human, tiger, monkey, dog, crocodile, mice, snake, frog, certain poisonous fish, leech, stinging insect, crow, eagle, owl, and any other bird of prey. Pork, chicken, fruit, vegetables, freshwater fish, and seafood are widely consumed. However, just like most Hindus, Balinese Hindus rarely if ever eat beef. This is especially true for those who belong to the higher castes of Brahmin and Kshatriya, who have special dietary restrictions. Brahmins especially are forbidden to consume or even touch the flesh of bull or beef; additionally they must not eat on the street or marketplace, drink alcohol, or taste the offering food and fruit. Balinese Hindus built Pura Parahyangan Agung Jagatkarta, the second largest temple in Indonesia after Pura Besakih in Bali, dedicated to Hindu Sundanese King Sri Baduga Maharaja Sang Ratu Jaya Dewata. Pura Aditya Jaya is the largest temple in Indonesian capital Jakarta. At least four Balinese Hindu temples exist in Europe. A padmasana exists in Hamburg, Germany in front of the Museum of Ethnology, Hamburg. Pura Girinatha in Dili, Timor Leste, was built by Indonesian immigrants. The recently constructed Pura Tri Hita Karana is located in Erholungspark Marzahn park in Berlin, Germany. Two Balinese Temples exist in the Pairi Daiza botanical garden in Belgium. ^ "Sensus Penduduk 2010 - Penduduk Menurut Wilayah dan Agama yang Dianut" [2010 Population Census - Population by Region and Religious Affiliations] (in Indonesian). Badan Pusat Statistik. Retrieved 2014-05-27. ^ a b c d e f g h Michel Picard (2004). Martin Ramstedt, ed. Hinduism in Modern Indonesia. Routledge. pp. 9–10, 55–57. ISBN 978-0-7007-1533-6. ^ a b c d Margaret J. Wiener (1995). Visible and Invisible Realms: Power, Magic, and Colonial Conquest in Bali. University of Chicago Press. pp. 51–55. ISBN 978-0-226-88580-3. ^ a b McDaniel, June (August 1, 2010). "Agama Hindu Dharma Indonesia as a New Religious Movement: Hinduism Recreated in the Image of Islam". Nova Religio. 14 (1): 93–111. doi:10.1525/nr.2010.14.1.93. ^ Helen M. Creese (2016). Bali in the Early Nineteenth Century: The Ethnographic Accounts of Pierre Dubois. BRILL Academic. pp. 226–227. ISBN 978-90-04-31583-9. ^ a b Ngurah Nala (2004). Martin Ramstedt, ed. Hinduism in Modern Indonesia. Routledge. pp. 77–79. ISBN 978-0-7007-1533-6. ^ Martin Ramstedt (2004). Hinduism in Modern Indonesia. Routledge. pp. 26–28. ISBN 978-0-7007-1533-6. ^ a b James Boon (1977). The Anthropological Romance of Bali 1597–1972: Dynamic Perspectives in Marriage and Caste, Politics and Religion. ISBN 978-0-521-21398-1. ^ a b c Miguel Covarrubias (2015). Island of Bali, Periplus classics. Tuttle Publishing. p. 87. ISBN 9781462917471. ^ "Pura Aditya Jaya, Pura Terbesar di Jakarta" (in Indonesian). SOUL OF JAKARTA. Retrieved 3 September 2017. ^ "CELEBRATION: Balinese Festival Finds Home in Germany". Hinduism Today. Retrieved 18 July 2017. ^ The Bali Times: Pastika Thanks Gusmao over Dili Temple, accessed on November 24, 2015. ^ The big balinese temple. ^ Pura Bunga - the flower temple. Davison, Julian; Granquist, Bruce (1999). Balinese Temples. Periplus Editions. ISBN 978-962-593-196-8. Eiseman, Fred B. (1989). Bali: Sekala & Niskala Volume I: Essays on Religion, Ritual, and Art. Singapore: Periplus Editions. ISBN 978-0-945971-03-0. Haer, Debbie Guthrie; Morillot, Juliette; Toh, Irene (2000). Bali: A Traveller's Companion. Editions Didier Millet Pte Ltd. Publishers Ltd. ISBN 978-981-3018495. Hobart, Angela; Ramseyer, Urs; Leeman, Albert (1996). The Peoples of Bali. Blackwell Publishers Ltd. ISBN 978-0-631-17687-9. Jones, Howard Palfrey (1971). Indonesia: The Possible Dream. Hoover Institution Publications. ISBN 978-0-15-144371-0. Vickers, Adrian (1989). Bali: A Paradise Created. Periplus. ISBN 978-0-945971-28-3. Hughes-Freeland, F. (1991). Javanese visual performance and the Indian mystique. Delhi: Aditya Prakashan. Cœdès, George (1968). Walter F. Vella, ed. The Indianized States of Southeast Asia. trans.Susan Brown Cowing. University of Hawaii Press. ISBN 978-0-8248-0368-1.